Fall is almost upon us on the Mendocino Coast. Our tomatoes are finally getting some sun and our first rain of the season is predicted. 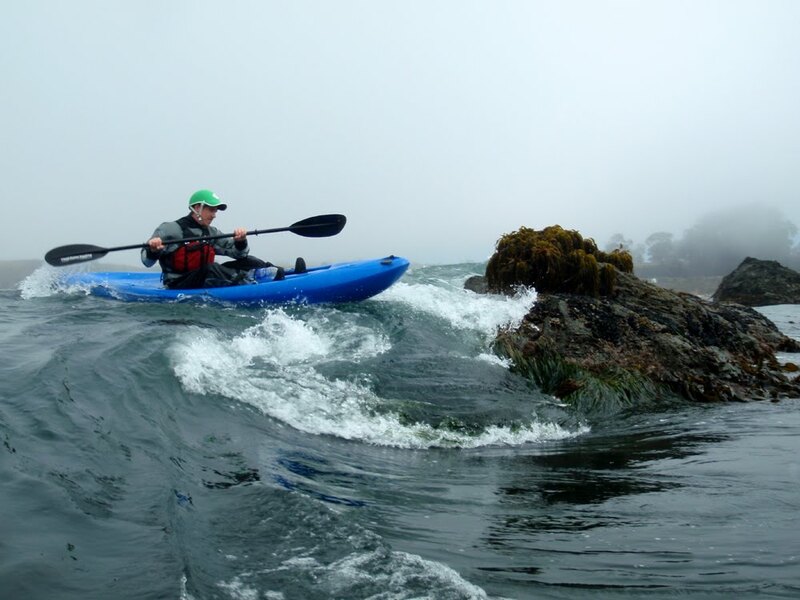 Yes, we get excited about rain which in Mendocino County means mushrooms and whitewater kayaking. 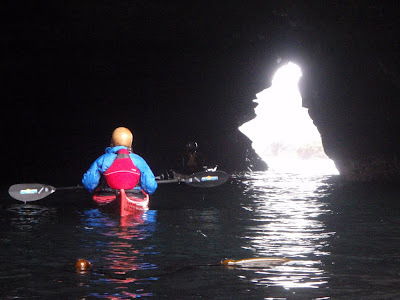 After a super busy summer with lots of visitors joining us kayaking; we are enjoying quieter days, the late summer weather, and calm coastal paddling conditions. 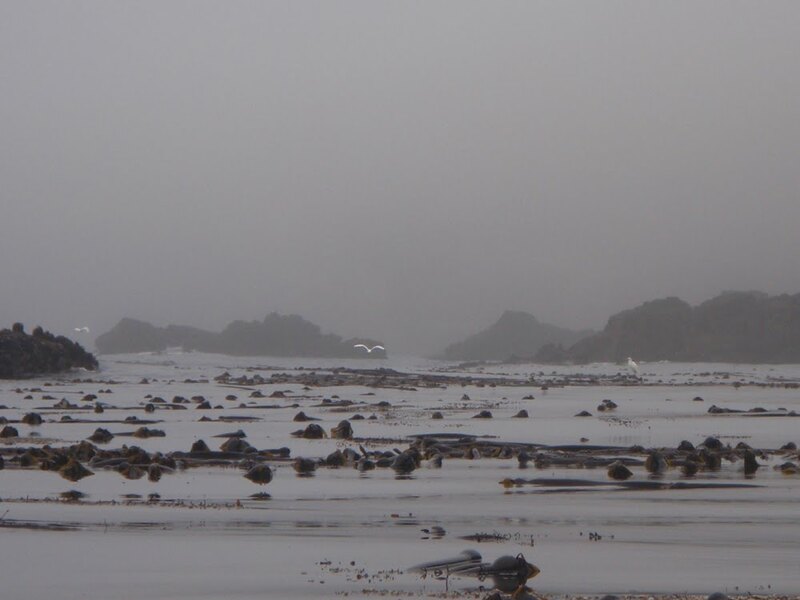 Many of the old time fishermen tell us that these calm ocean conditions with lots of fog used to be the norm for our ocean in the summer. 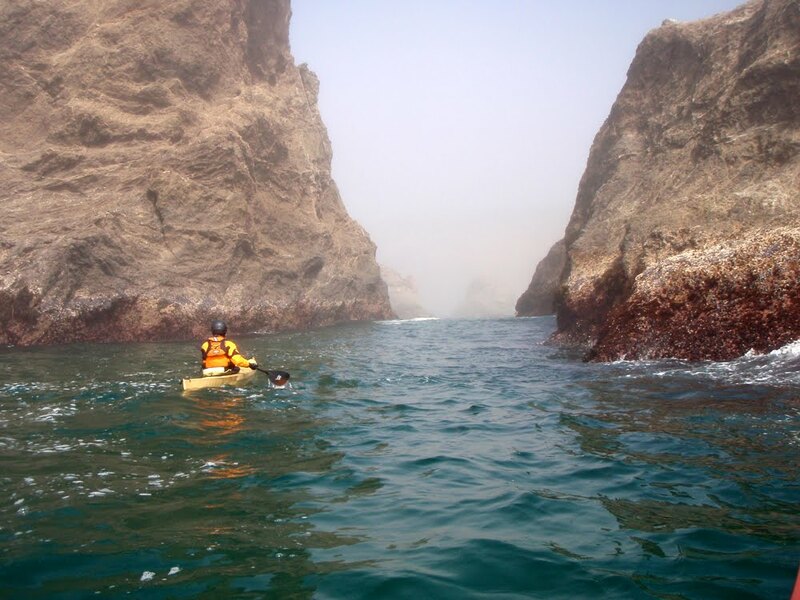 We are enjoying our relatively calm seas and are planning some special trips for the fall of 2011 including a Tour de Mendo with new twists. One of our recent exploratory paddles involved a beach launch at one of our most picturesque Mendocino Coast beaches followed by paddling around giant sea stacks and headlands with sea caves that were interconnected by tunnels. Any guesses where we were? No, it is not Russian Gulch, Elk, or Van Damme. Jeff and I are also cleaning out the gear closet and kayak rack and having a sale. 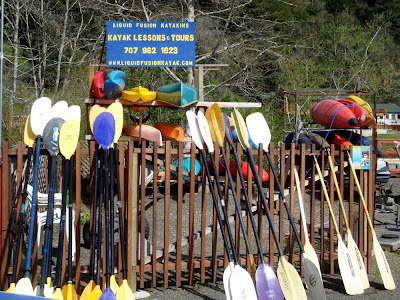 We borrowed Marna of Kayak Zak's idea of a kayak yard sale and put our own spin on it to make it an online yard sale. 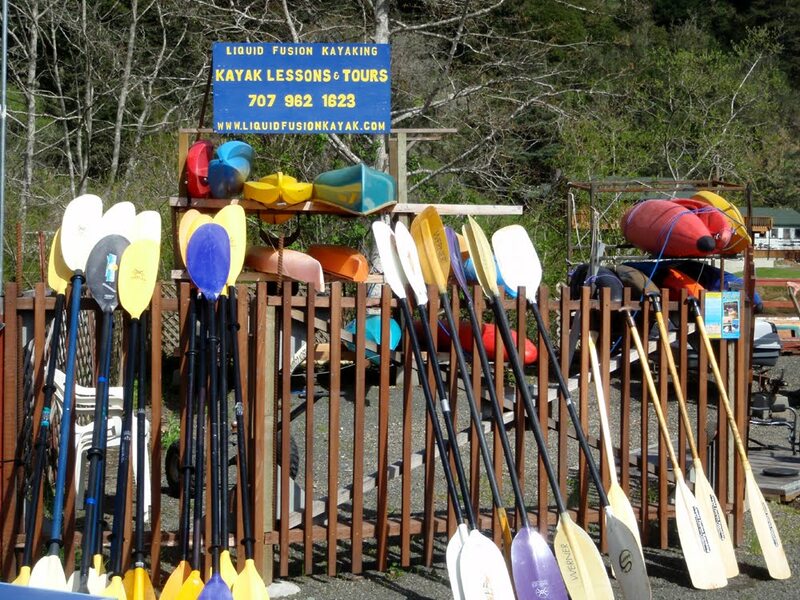 Check it out and see if there is any kayaks or gear that you need. 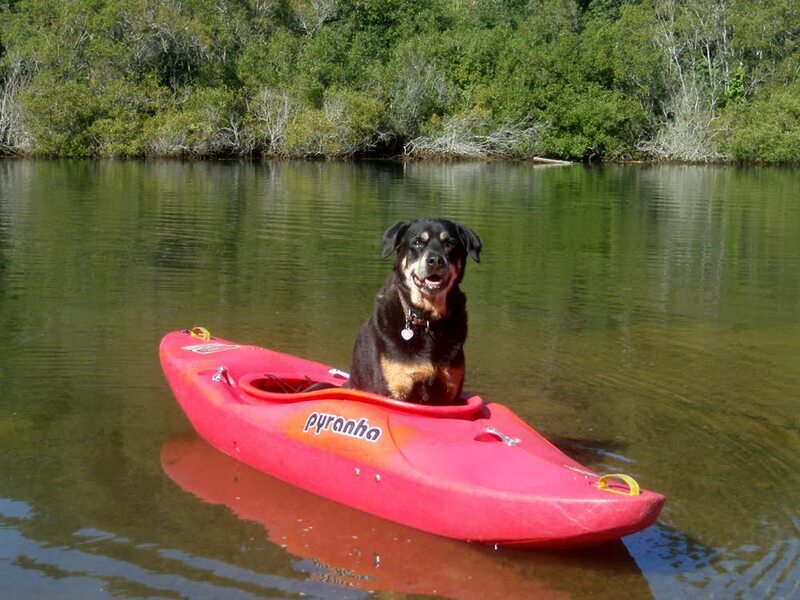 We are offering lots of fall kayaking classes for beginning through advanced paddlers. Monday night, our Introduction to Kayaking Class starts at the Mendocino Park and Rec. CV Starr Pool. 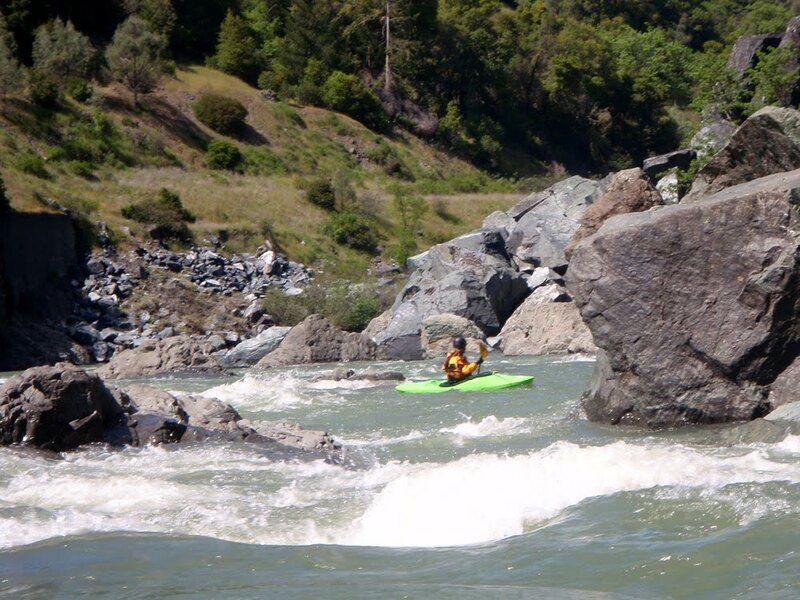 Next weekend as the Bay Area Sea Kayakers visit, we are offering several kayak rock gardening classes including our specialty - Whitewater of the Sea. In October, we are preparing for birthday celebrations as both Jeff and I celebrate birthdays in October. 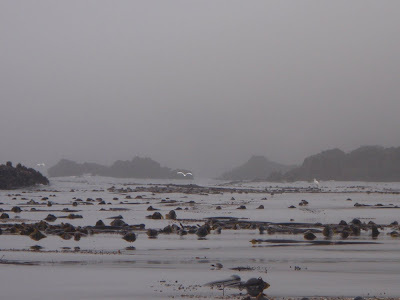 Lots of play in short boats is likely to be in store (kayak surfing and rock gardening). We are also looking forward to attending the Traditional Arctic Kayak Symposium just to the north of us in Trinidad, CA. Planning for 2011 is in the works . . . more Tracks to Kayaks, regular kayak surfing instruction, winter and spring whitewater classes in Mendocino County and beyond . . . are a few more goodies that we are adding in for 2011. 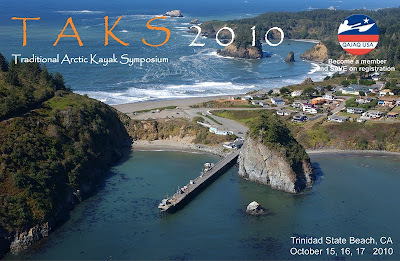 If you have a special group, trip, or event that you would like to plan for 2011 - let us know. Great write-up Cate. I can't make it up for the BASK event but I definitely want to get up there and do some playing this fall. Thanks Bryant. I hope that you are having a great trip to the islands.